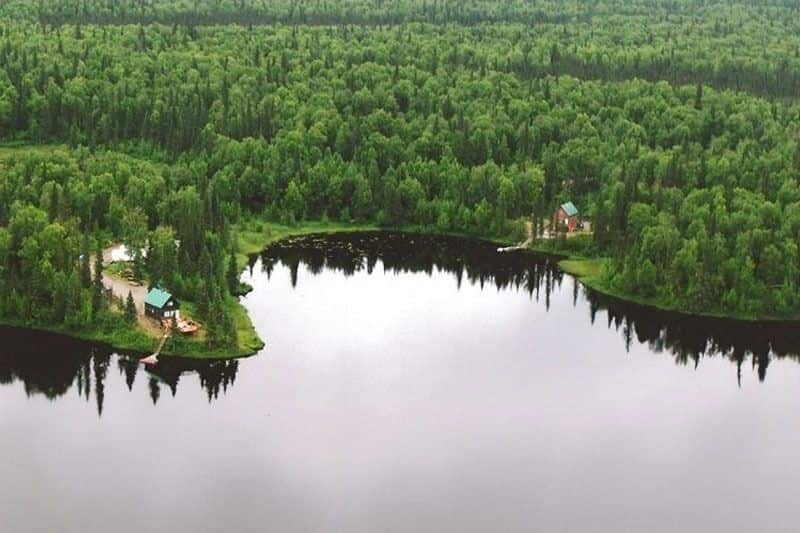 New Lake Front Cabin: Fully equipped for your Ultimate Alaskan Experience - This outstanding property is located near the Southern Edge of Denali National Park, which is 114 miles North of Anchorage. The area boasts some of the best scenery in the interior of Alaska, as well as arguably, the best snow machining in the world. 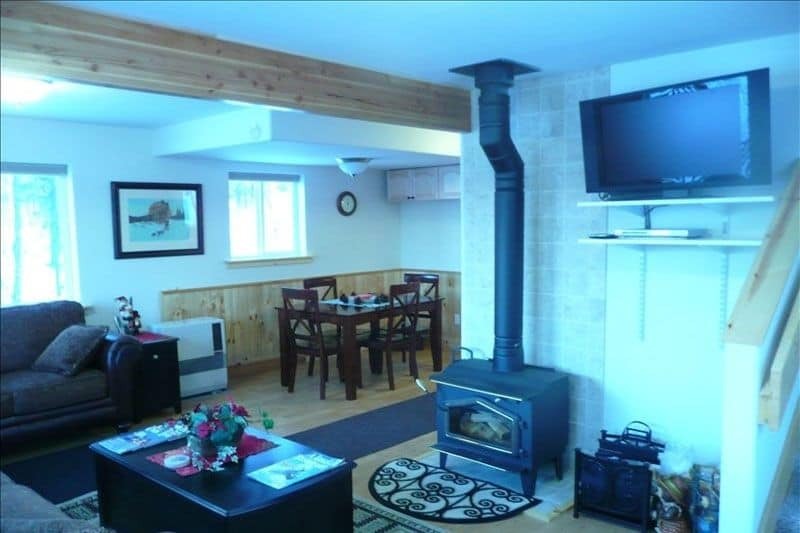 This beautiful cabin is fully furnished with everything you will need for your lakeside vacation, including linens, kitchen appliances, dishes, range/oven, gas BBQ, microwave, flat screen TV with DVD... So reserve your getaway today!. 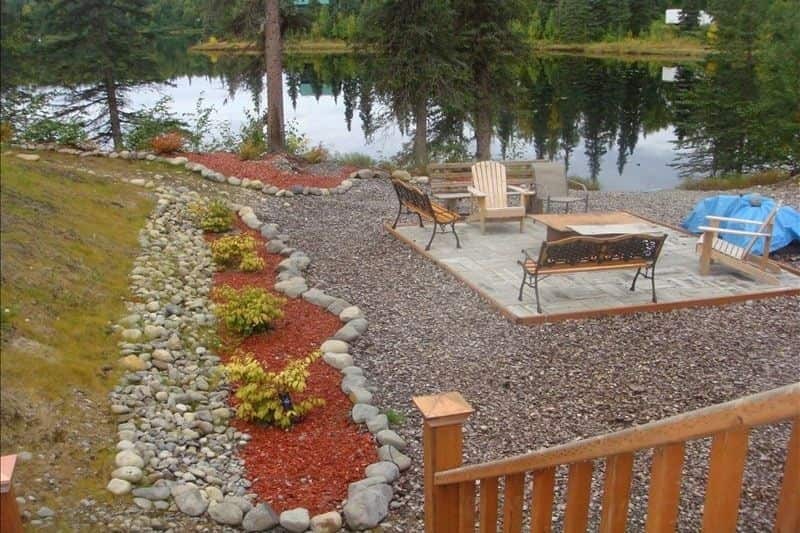 -A large deck overlooks the lake with view of Mt. McKinley. -Two bedrooms - one with two queen beds, the other with one queen bed overlooking the lake. -In the summer, there is a dock with canoe, kayak and paddle boat. (Six adult life vests), Some boating skill necessary for kayak and paddle board use. -A wide, gently sloping path for snow machines leads directly from the large multi-car, RV parking area down to the lake. -Wooded areas surround the property. -Large birch and evergreen trees enhance the enjoyment of this peaceful setting. -A huge steel outdoor fire-pit near the waters edge allows a large or small group to spend a warm evening outdoors. 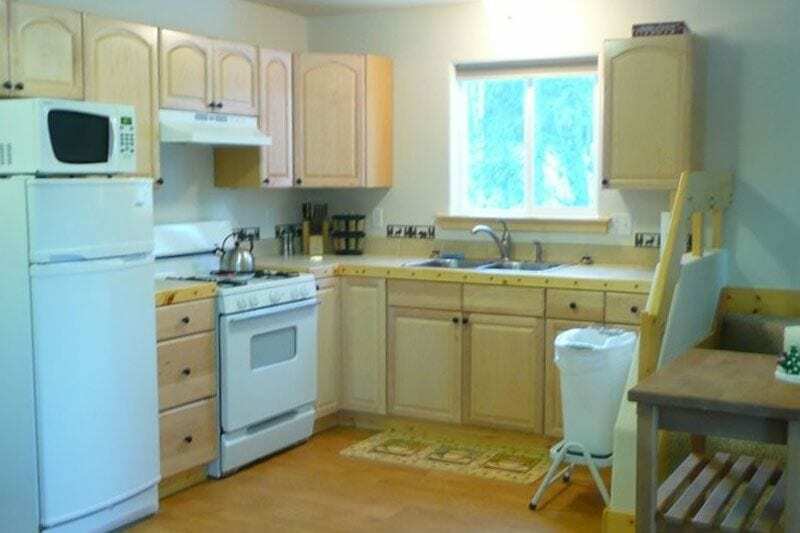 NOTE: For an additional fee there is a first floor family room with an additional kitchenette and a larger flat panel TV/surround sound theater area, along with a 3/4 bathroom with shower. The rental of the family room increases the occupancy capacity by two, for a total of eight, 8 guests. Our stay at Amber Lake was amazing! It was cozy, quiet and peaceful. It is the perfect place to get away and unwind. Thank you Tom and Tina for letting us use your cabin! We had a great time at Tina and Tom's cabin. The day we arrived it was very clear. We could see the tip of Mt Denali above the tree line. We couldn't wait to get out on the lake. The paddle boat and canoe were fun. We took some gorgeous pictures at sunset and built a fire in the fire pit. It was nice to have a grill to use to keep the meals simple. We could've shopped at Wasilla for groceries instead of Anchorage but they were both on our way. It rained the next two days but it was still fun. We took Talkeetna Air Taxi (small beaver plane) over Denali and man was it the coolest thing ever!! First trip to Alaska was a cruise but we recommend you get off the boat and really see Alaska! Have fun, we sure did!! Our family of six (two parents and four teens) stayed at the cabin Aug 10 - 12. Nancy was there when she said she would be with groceries for us from her own home as we didn't think we'd have time to get to the store before arriving. We rented the basement level as well to create enough comfortable sleeping for all. Even though it was remote, it was easy to find. We were glad we stayed put as the drive to the grocery store and Talkeetna is a long haul. We recommend this cabin! Beautiful place, had a great time. Never realized how quiet the outdoors can be at 5 AM. I was impressed when Tom called me within a few minutes of making our reservation. Tom was very helpful on the phone and advised me of where to buy groceries and how to find the cabin. Tom also gave me tips on what to expect in Alaska during our stay. Having Nancy (the cabin's care taker) meet and greet us was a wonderful personal touch. Nancy met us with the kindness of a family member, answered any questions we had and gave us great ideas of places to eat and visit. Very nice get away. 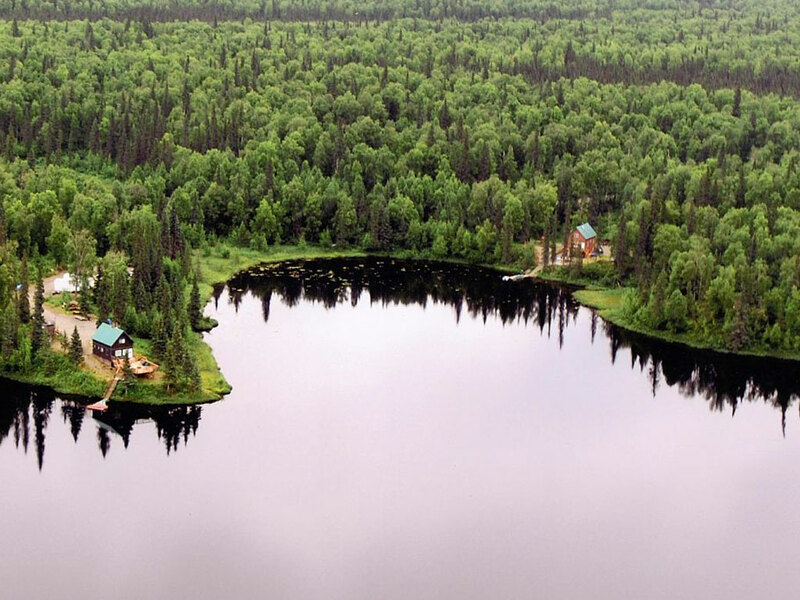 It is definitely isolated, but there is satellite tv and a little bit of Internet. Kayak and paddle boards are nice. The Cabin was cozy and comfortable. We rented the "upstairs" and had more than enough room for our party of four, and the amenities (inside and outside) are generous. We did not lack for anything. 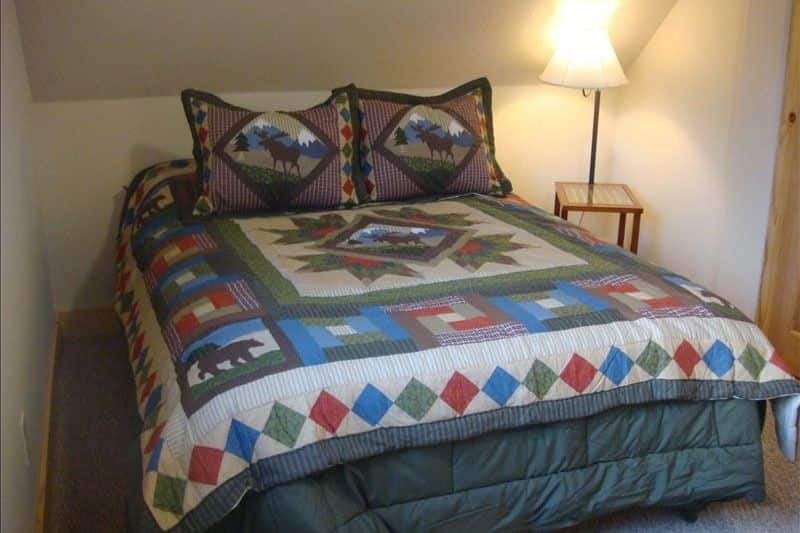 Comfortable beds, clean home, soft towels! Tom is very fast with communications, and the directions to the home are quite clear and accurate. This property was beautiful, secluded and very quiet. 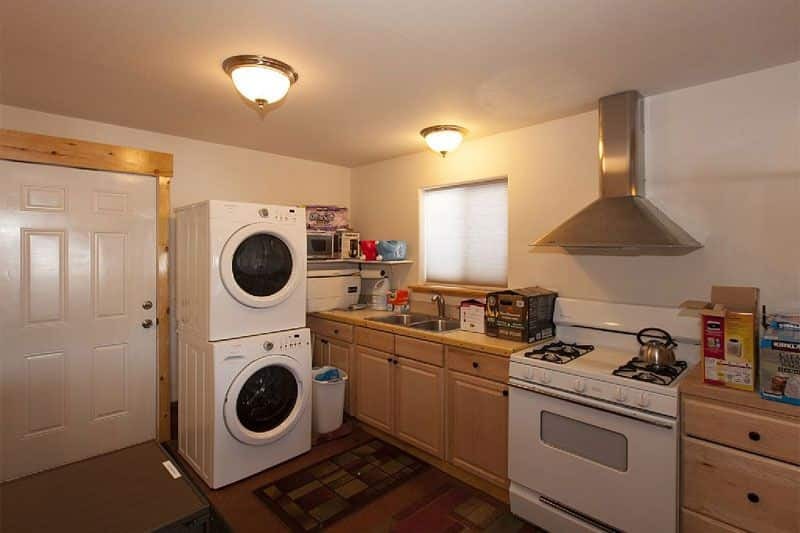 It had all of the amenities and more than you could ask for in a rental. It had 2 large bedrooms and 21/2 baths, beautiful views overlooking a peaceful lake, Bar-B-Que equipment, a paddle boat, etc. etc. The kitchen was well stocked, with lots of spices and basic baking and grilling supplies, plenty of paper products, etc. 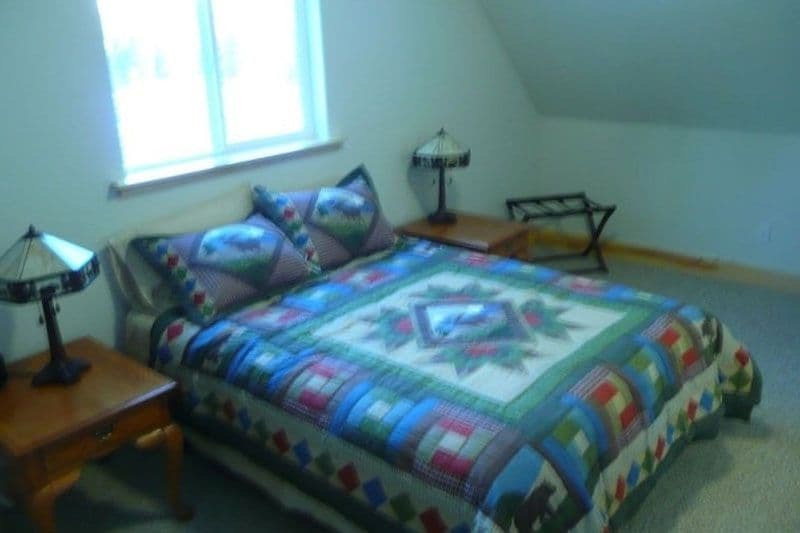 This cabin was beautiful with all the amenities you could ask for. Our family's moved to Alaska in the early 70's. We moved here for the Alaskan Experience. 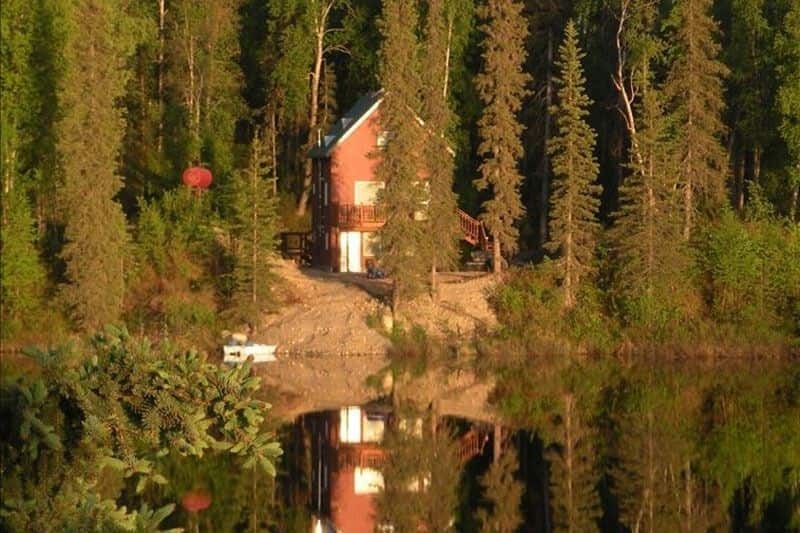 During our pursuit of that experience the family became involved in staking out Alaskan Open-Entry land and taking advantage of public land auctions. The land this cabin sets on was purchased at auction. Our family grew up on this property and the 5 acres next door. Our children .... Read More.